What do you think public relations is? For the past thirty years, the Public Relations Society of America has defined it as follows: “Public relations helps an organization and its publics adapt mutually to each other. Hunh?!? The PRSA recognizes that this definition may not be meaningful to many people. It is surely outdated even for those who subscribe to it. Gini Dietrich, Martin Waxman and I talk about the PRSA’s initiative to develop a new definition of public relations on this week’s Inside PR. I’m not sure that they PRSA’s “fill in the blanks” crowd-sourcing approach will yield the type of definition that truly reflects the enhanced role of PR in the era of social media. Sadly, I think it lends itself to a “we act on people” definition, not the “we are part of something” perspective that is more appropriate to the age of social media. Hopefully, my fears are misplaced and the PRSA will come up with something much more sophisticated. To do so, they need look no farther than the definition developed by the Canadian Public Relations Society. The CPRS defines public relations as “the strategic management of relationships between an organization and its diverse publics through the use of communication to achieve mutual understanding, realize organizational goals and serve the public interest.” In my opinion that’s a much better definition. Gini Dietrich suggests that whatever definition is adopted, it will only be useful if it can be readily understood by the general public. And she believes that right now most people believe that PR amounts to little more than media relations. I agree. Seeing PR as media relations is too restricting. It puts the PR industry in a small box within marketing or communications. A more expansive definition is needed that captures PR’s full role in the era of social media and meaningful online relationships. Jeff Jarvis launched his new book, Public Parts, in Canada last week at Third Tuesday Toronto #3TYYZ and Third Tuesday Ottawa #3TYOW. Judging from the participant reviews on the third Tuesday websites, Jeff presentation was one of the most popular and well-received presentations in six seasons of third Tuesday. Stephen Da Cambra: really enjoyed Jeff’s presentation. It appealed to me directly because of my own struggles with giving up my privacy on the web. Even high-profile guests can ramble on a bit – but Jeff was on point throughout, with enough short divergence to keep it interesting. Rick Weiss: Jeff Jarvis was great. He’s an engaging speaker and presented a lot of food for thought around privacy in the digital age. Aggie Fortier: The speaker was very engaging with interesting examples to support his position. More importantly, Jarvis opened the door to discussion on the implications of public versus private. He has raised the bar for future speakers who follow. Martin Waxman: Jeff Jarvis speaks the way he writes and is entertaining, provocative and insightful. Really enjoyed the talk; looking forward to reading the book. Dave Fleet: Fascinating subject and a phenomenal speaker. One of the best presentations I’ve been to in a while. Jim Courtney: Really excellent introduction to and perspective on privacy issues. Loved the stories and historical perspective. Nigel Newton: Jeff Jarvis is an evangelist for societal change enabled by the net. His generosity of spirit and his belief that we, the users of the net, are capable of respecting the ethics of privacy and public sharing is persuasive. If fear of technology is the primary emotion holding back the natural evolution of the net and its influence on society, then Jeff’s well-crafted perspectives will be a source of courage for the faint-hearted. Eden Spodek: Jeff Jarvis is a fantastic speaker and I would attend a Third Tuesday anytime he’s invited here – even if he’s not launching a new book. He brings the online privacy discussion to a whole new level and I enjoyed his insights on cultural differences and privacy. I can’t wait to devour Public Parts. Zach Klein: Great session. Super smart dude. Mark Blevis: Jeff is an engaging and animated speaker. I really enjoyed this event. It was of high caliber. I could have happily listened for another two hours. Alfred Coates: I really enjoyed how Mr. Jarvis’s message of openness and sharing felt like a mix of opportunity and challenge to those in attendance. Mr. Jarvis speaks with passion and conviction and a healthy dose of humor. 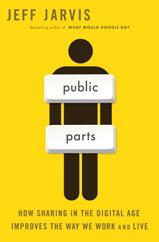 I will be reading public parts this weekend and working my way through Buzzmachine in the foreseeable future. Karen Runtz: While many speakers may be entertaining at the time, what they say won’t stick with you. That’s not the case with Jeff Jarvis. I have his book for reinforcement! No, seriously, I did find his presentation memorable. It brought me in mind of the excitement I felt at a conference some 15 to 20 years ago hearing and Ithaca U prof talk about the changing nature of communications. She was encouraging us to think of our “products” as workable clay, instead of finished polished pieces sent on their way. That resonated with me, just as Jeff’s words about the Internet did last night. That’s just a selection of the rave reviews for Jeff Jarvis’s Public Parts presentation at third Tuesday. If you want to read the full set of reviews, you can find them at the Third Tuesday Ottawa and Third Tuesday Toronto event sites. We are hoping that Jeff will be able to come back to Canada for third Tuesday Calgary and third Tuesday Vancouver in either January or February. And if you’re in another city and are looking for a great speaker with thought-provoking content, Jeff Jarvis won’t disappoint. Melanie Coulson, the online editor at the Ottawa Citizen blogged her impressions of Jeff’s presentation. Don Butler of the Ottawa Citizen also interviewed Jeff for an article which appeared in Saturday’s edition of the newspaper. If you were at the event and wrote about it, please leave a comment and post the link to your coverage. I’ve “Storyfied” some of the highlights of Jeff Jarvis‘ launch of Public Parts at Third Tuesday Ottawa. The Ottawa #3TYOW Storify starts at the beginning of the event and runs through to include subsequent blog and newspaper coverage. Thank you Jeff for having come to both Ottawa and Toronto to share your insights with us. And thank you to Third Tuesday’s sponsors. You make it possible for us to bring speakers of Jeff’s calibre to Third Tuesday’s across Canada. I’m really excited about this news: Jeff Jarvis is coming to Third Tuesday Toronto #3TYYZ and Third Tuesday Ottawa #3TYOW for the Canadian launch of his new book, Public Parts: How Sharing in the Digital Age Improves the Way We Work and Live. Blogger at Buzz Machine. Author of What Would Google Do? Associate professor and director of the Tow-Knight Center for Entrepreneurial Journalism at the City University of New York’s (CUNY) Graduate School of Journalism. Co-host of This Week in Google with Leo Laporte and Gina Trapani and Leo’s TWiT netcast network. And now author of a new book, Public Parts. Jeff will be coming to third Tuesday Toronto on a special day, Thursday, November 17, and to third Tuesday Ottawa on Friday, November 18. Yes, that’s third Tuesday on a Thursday and Friday. This should be a great event and we’ve booked a larger hall so that we can accommodate as many people as possible. Still, if past experience is any guide, we’ll sell out. So if you’re planning to be in Toronto on November 17 or Ottawa on November 18, click over to the Third Tuesday Toronto or Third Tuesday Ottawa sites and sign up to meet and hear Jeff Jarvis. And if you’re worried about getting a copy of the book, all attendees who sign up will receive a copy of public parts when they arrive at the event. So you’ll have your copy their to have autographed by the author. Third Tuesday Ottawa #3TYOW and Third Tuesday Toronto #3TYYZ with Jeff Jarvis. I hope to see you there. As you know, Third Tuesday is a community-oriented, volunteer-driven event. And we wouldn’t be able to bring great speakers like Jeff Jarvis to Third Tuesdays across the country without the support of some like-minded sponsors. We’ve been lucky to have some great companies step up over the past several years to help us make Third Tuesday happen. Big thanks are due to CNW Group, Rogers Communications, the Canadian Internet Registration Authority, Radian6 and Cision Canada for making the 2011/12 Third Tuesday season possible.